These new regions are in addition to the previously supported regions of US-East-1, US-East-2, and US-West-2. Also, there are new features for API keys. 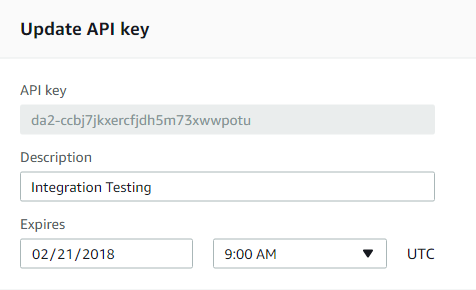 You can now extend the duration of API keys for up to 365 days. Additionally, you can create more than 10 API keys (the previous default was 10). To extend the duration of your API key, navigate to the AWS AppSync console, choose Settings for your API, and choose one of the API keys listed. Choose Edit, and then use the date picker to choose an expiration date. Press Update when complete. sample apps online. We’re excited to hear your feedback on these features and see what you’re building with AppSync. If you have any questions, you can connect with us any time on the AWS AppSync forums.